Waiting For A Train reached #7 in the UK during 1983, and was Flash And The Pan's only Top 40 hit. In the band's home country of Australia, the song faired even worse reaching only #98. The duo's highest charting single in the UK that failed to break the Top 40 was And the Band Played On (Down Among The Dead Men), which reached #54 in 1978. Now here's a tricky question for you! Is the vocalist rapping, singing or just talking? You decide! The song was taken from the album Headlines, but also featured on the compilation album Pan-orama which reached #69 in the UK album charts during 1983. 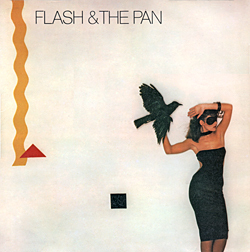 The best songs from the previous three studio albums - Flash And The Pan, Light In The Night and Headlines - featured on the compilation. Flash In The Pan were Harry Vanda and George Young who were former members of The Easybeats. 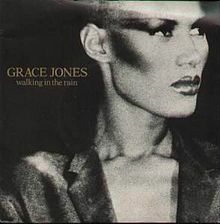 Grace Jones released a cover version of Flash & The Pan's third single Walking In The Rain on her 1981 album Nightclubbing. This was the Australian band's first single release and reached #5 in Australia. The song was released worldwide in 1978 and reached #76 in the U.S. The track featured on the band's self-titled debut album which was released in 1979.